How to get to Camping Seiser Alm in Fiè allo Sciliar/Völs am Schlern. Fiè allo Sciliar/Völs am Schlern is located on a high plateau above Val d'Isarco/Eisacktal, at the foot of the Sciliar/Schlern mountain range. Here you can find the best route to get to our campsite. 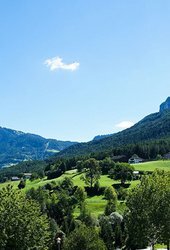 The best way to reach Camping Alpe di Siusi/Seiser Alm is via Prato all'Isarco/Blumau. Arriving from Brennero/Brenner, take Bolzano/Bozen North exit and turn left in direction Prato all'Isarco/Blumau. In Prato all'Isarco/Blumau, in the tunnel turn left direction Fiè/Völs (approx. 7 km). After 3.5 km turn left and you will reach Camping Seiser Alm. If you want to avoid toll roads, take Fernpass and continue via Landeck, Resia/Reschen, Malles/Malsm Merano/Meran, Bolzano/Bozen and to Camping Seiser Alm via Prato all'Isarco/Blumau. You can use our route planner to find your way to our campsite. Simply put in your departure address and our route planner will calculate the quickest route for you.